Today I’m sharing with you a new type of printable and I can’t wait to get your feedbacks: A6 printable traveler’s notebook inserts! This printable will help you create an A6 notebook with a month worth of undated daily pages. I voluntarily created it with a basic design so that it can fit most decoration styles and you can really make it your own. 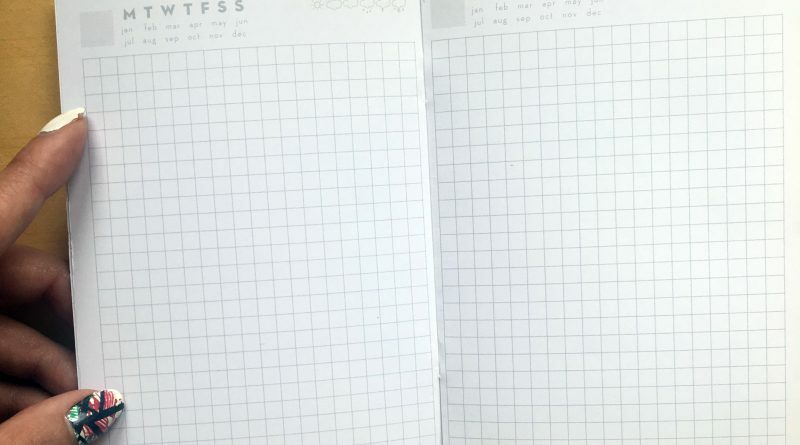 Each daily page contains space for you to add the date (add the number in the grey square and circle or color the week day and month). You can also use the weather icons to keep track of the weather. The rest of the page is a 0.5mm grid. Perfect for doodling, lettering and writing of course! I’ve started to prepare other pages design, but I think that this one is generic enough to fit most needs so I’m thinking it’s a good first choice to share with you! Below in this article I’m detailing printing & assembling instructions. I would really love to hear your feedbacks and advices to help me improve these files and make them even easier for you to use. Please let me know how your printing, assembling goes and if there’s anything I could change to make it easier for you or if there’s anything in my instructions that seems unclear. I’ve included 2 types of files: one with crop marks only on the cover (1st page) and one with crop marks on every page. Which of the 2 assembling/cutting methods do you like best? Which file do you prefer to use to create your notebook? I feel like sometimes, crop marks end up being visible on some pages and so I wanted to offer an option with crop marks only on the first page. Plus, I usually assemble my notebook and then only cut all my pages at once with a big cutter so I only really need crop marks on the cover. The file contains 17 pages. I recommend you print page 1 first on its own (the notebook cover) and that you print pages 2 to 17 with duplex printing (or print on both sides manually: by printing even pages first, then flip your stack of paper, then print odd pages). 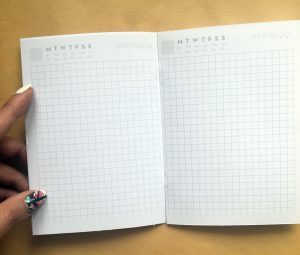 You’ll need 9 sheets of paper to create this monthly notebook. First, make sure to download the files on your actual computer (do not print off of a webpage). Make sure “actual size” or “100%” scale is selected (DO NOT select “fit to page”) – the image will automatically be centered in the center of your page. If your printer doesn’t allow duplex printing, or if you don’t like using duplex printing: print odd pages first, then flip your stack of paper and print all your even pages. Get familiar with your printer and try a few pages first to make sure you understand how your printer feeds and print paper. –> recommended if you fold and assemble your notebook before cutting to notebook size with a metal ruler and cutter/ X-acto knife. Note: you now have what looks like a half US letter or A5 notebook, you now want to trim it to your desired notebook insert size (regular, pocket, A6, passport, etc). I’ve included crop marks on the 1st page only to help you cut your notebook to size. Cut your notebook to size with a metal ruler and an X-acto knife, cutter or rotary cutter. This way, the notebook edge will be neat and pages well aligned. Note: the downside with this method is that since all the pages are the same size, the edge of your notebook is not going to be as neat as if you used the previous method (assembling then cutting > cutting then assembling). Thank you very much as a TN planner user this is very much appreciated. Keep them coming. Thank you so much for this printable!! It is so perfect!!! Even though I mostly use the B6 Slim size, I intend to print this a6 and just cut it to fit the the B6 Slim. Thank you so very much!!! This will be part of my sister inlaws christmas- gift (a homemade TN) this year. And of course I will point out to her that if she wants to refill her TN or fill it with other goodies, or just find inspiration, she can take a look at your homeside. /Thankful maker of a Swedish homemade christmasgift. Thank you for this!!! Easy to understand the print and assemble!! You are a life saver!! !